Remember M3-neony and M3-synchy, two humanoid robots from Japan we’ve shown you back in March? 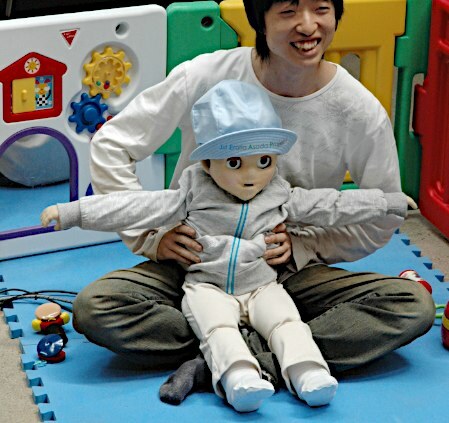 Well, it seems Japan still doesn’t have enough of creepy kid-like robots, as the so-called JST Erato Asada Project in Osaka today unveiled [JP] another two: M3-Kindy and Noby. Similar to neony and synchy, the purpose of the new robots is to help scientists explore human cognitive development processes in children and infants through human-robot interaction and communication. Weighing 27kg, M3-Kindy (“Kind” as in “Kindergarten”) is supposed to look like a 5-year old child (he’s pictured above). The robot boasts 109 touch sensors, 42 joints, two cameras (one for each eye), and two microphones (one for each ear). 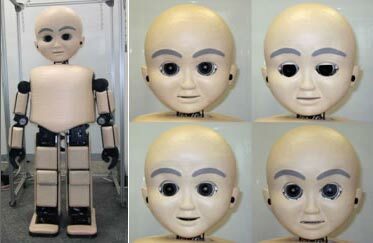 Noby (“Noby” as in “New-born Baby), on the other hand, is an infant-like robot who even looks creepier than M3-Kindy (see pictures above and below). He weighs 7.9kg and stands 71cm tall. Noby even has 600 touch sensors in his body, next to two microphones and two cameras. Noby is supposed to help scientists understand how a 9-month old baby develops over time.